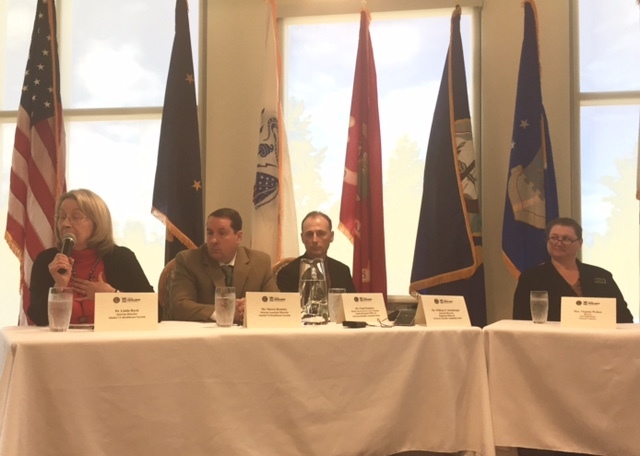 On the far left, the new interim director for Alaska’s Veterans Affairs, Dr. Linda Boyle, and to her right Associate Interim Director Shawn Bransky. A move by the Obama Administration has freed up money in Alaska to close a funding gap in healthcare for veterans. But officials in Alaska say it isn’t a silver bullet for difficulties vets have faced the last few months connecting with care. The Choice Improvement Act signed by the President July 31st lets Alaska shift about $20 million between programs in order to restore services that have slowed in recent months. “Essentially what it did here in Alaska is it gave us the flexibility to get that money moved over from the Choice Act to our non-VA Care Coordination funds,” said Shawn Bransky, interim associate director for Veterans Affairs in Alaska. That money will plug holes in healthcare until the end of the fiscal year on September 30th. The funding shortfall came in part because of national changes to how the VA pays outside providers for healthcare. The Choice Act passed in August of 2014 is credited with reducing wait-times, but has also proved far more expensive than anticipated. In Alaska, which served as the model for VA reforms, the program backfired, extending wait-times and suddenly making routine care more complicated. Before VA funding was turned off eight weeks ago to reign in budget overages, Alaska’s veterans were having difficulty with the third party company, TriWest, handing care under the Choice Program. Particularly for veterans around Kenai, the Mat-Su Valley, Fairbanks, and Juneau, everything has gotten harder, according to the state’s Director for the Department of Military and Veterans Affairs Verdie Bowen. While the $20 million in restored funding will help paying for faster care, the complicated mix of national, state, and local programs isn’t always as nimble as patients and providers need it to be. And even though the money is back, there is still some accounting that has to take place before the effects are felt. The Alaska VA also has a new interim director, Dr. Linda Boyle, a 25-year veteran of the Air Force. And next week the nation’s Secretary of Veteran’s Affairs, Robert McDonald, will be in Alaska. He is planning to attend meetings in Wasilla, Kotzebue, and Point Hope.